What Sets Conference Calling Companies Apart? Even in 2019, conference calling is still a huge part of doing business. No matter what type of company or how many employees you have, conference calling remains one of the easiest, low-barrier-to-entry solutions to getting a bunch of people on the same page at once. Technology and the internet have definitely changed the landscape of doing business over the past two decades, but even as technologies advance there is one communication tool that has stayed strong: the telephone. Its history is long and its use is essentially ubiquitous worldwide. As far as anyone can tell, telephone calls and conference calling aren’t going anywhere anytime soon. With nearly every single company in need of a conference calling solution of one kind or another, what factors go into choosing between all the different options out there? We’ll take a look at everything from dedicated lines, to PIN-free calling, to pricing options, so you can make an informed decision about which conference calling solution is going to be the best fit for your company. Let’s take a quick Conference Call Joining Journey. It’s an unfortunately common scene – business uses a free conference calling service, which doles out a new random number each time you need to do a conference call. Sound familiar so far? You have a weekly call scheduled with a new client. It’s the second or third week, and few lucky, industrious employees locate the calendar invite, find the new number, and join the call on time and without issue. But there they sit – waiting, ever so impatiently – as literally everyone else who’s supposed to be on the call searches for the new conference line number. Inevitably, texts and emails start pouring in with the fated, “Can someone re-circulate the conference number here pls? Can’t find it anywhere.” After a few direct replies (“One sec, finding it now” or “I think it’s the same as last week?”), some brave soul finally replies-all but accidentally copy-pastes last week’s number instead of this week’s. New emails start flying in correcting the (innocuous, sure) mistake, but only after several unlucky members make multiple attempts to join the wrong call. Just a part of doing business, right? Not with a dedicated line! One of the first things to look for when choosing a conference calling company is whether or not they offer dedicated lines. Having a dedicated number for your conference calls makes scheduling and joining calls so much easier. How? With a dedicated line, you can simply save the conference number to your address book, and employees and clients won’t have to dig through a calendar invite for a new conference line each and every time you have a conference call. Branded Bride Line offers exactly that! Another huge advantage of choosing a conference calling company that offers dedicated lines is PIN-free calling. Imagine the scene above, but exacerbated by a pesky PIN! Seriously, though, PINs are frustrating and offer yet another point on the already rocky Conference Call Joining Journey where mistakes can be made. PIN-free conference calling is the most seamless way to conduct conference calls. Dial the number and you’re in. That’s it. No more waiting around for folks to find the right number – no re-entering the wrong PIN. Plus, it feels fancy. Clients get to dial into calls directly with just a phone number. When looking at all of the features offered by various conference calling companies, one thing you’ll probably see advertised as a way to differentiate service tiers is the number of people who can join a conference call line. It’s vital to take this into consideration as you compare different conference calling solutions. It’s likely that all the conference calling solutions you’re considering offer some tier of their service that supports large groups of callers. In this day and age, it’s common for conference calling companies to support hundreds to thousands of participants on a single call. But not all large group conference call support is equal. At Branded Bridge Line, we offer conference calling with support for an unlimited number of participants. But we don’t stop there. We work with Tier 1 carriers to ensure crystal clear audio no matter how many people you plan to host on your call. While many conference calling companies support large group calls, few offer the tools to make those calls actually effective. 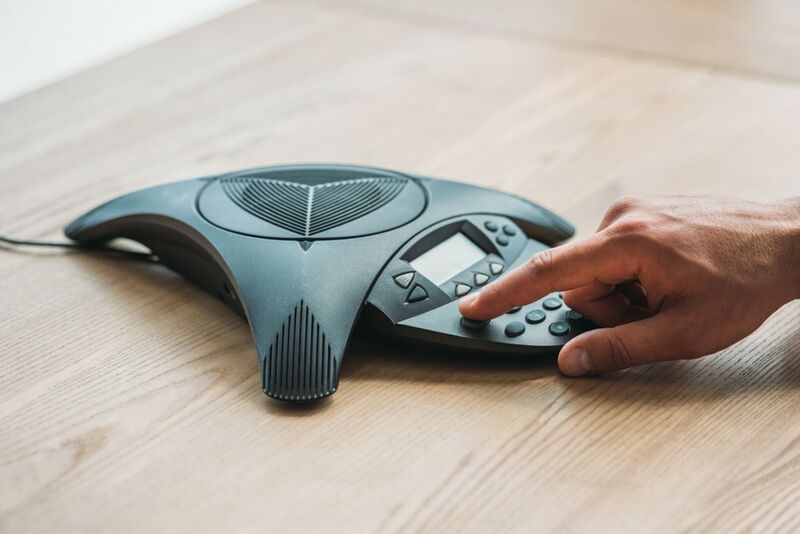 Beyond ensuring clear audio and strong connectivity, we pride ourselves in providing tools that are specific to the needs of large group conference calls. Participants can join by phone or by computer, plus with advanced conference call management and Lecture Mode, you’ll have complete control over screen sharing and changing which lines get muted and unmuted during the course of the call. Plus, all of our plans support an unlimited number of callers. We don’t believe in limiting the size of any calls. Just because you’re a small business this year, doesn’t mean you’ll be a small business next year. We support your growth and want you to have all the tools necessary without having to pay a premium. As always, price is a huge deciding factor when it comes to making any business decision. When looking for a conference calling solution that will fit your company’s needs, we believe that having options goes a long way. No two businesses are exactly alike, which is why we offer many different conference calling options at price points that fit various budgets. No matter which level you choose, though, every single one of our plans comes feature-packed with reliable connectivity, unmatched customer support, and a call management interface that is the simplest and easiest to use on the market. Fundamentally, we believe that you shouldn’t have to pay for top-notch conference calling quality – and, on the flip side, you also shouldn’t have to pay for features your company doesn’t need and won’t use. For example, a small or medium-sized business that regularly hosts small conference calls for a select group of employees – say, 15 or less – shouldn’t be forced to pay more for a bundle of extra numbers. Likewise, a larger company that may need more than one dedicated phone number for simultaneous conferences, but will use more than 1,000 minutes per month, should be able to save on the minutes they won’t use. Take a look at the conference calling pricing options on the Branded Bridge Line Plans and Pricing page to find the right plan for your company. Additionally, if your business has specific needs that aren’t included in one of the listed plans, our team is more than happy to work with you directly to design and price a custom plan made especially for your business. Branded Bridge Line offers a conference calling solution that’s worth serious consideration. With everything we offer, it’s time your business switches to the solution that offers better conference calling. For 24 hour conference call support, dial toll-free (888) 774-6990. If you have a call in progress and need support, you may also use the chat link at the bottom of this page.